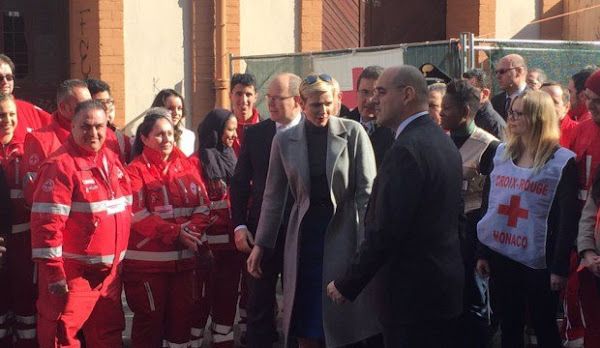 Yesterday, on February 18, Prince Albert II of Monaco, his wife Princess Charlene of Monaco and President of Red Cross of Monaco met with the refugees seeking asylum. Asyl in Monaco? Good idea, I consider this if "our" Mme Merkel continues like that! Finde ihr, wenn auch schönes Outfit, hier leicht "overdressed". Sie sieht immer klasse aus, aber Du hast Recht, manchmal schießt sie über das Ziel hinaus. Aber gut....sie ist schließlich royal und da erwartet man, dass sie heraussticht. Always with her sunglasses on the top of her head! Isn't it better that she have them on her head instead of in front of her eyes when they take pictures like Caroline?? Find something else to complaine about. Sunglasses is really to stupid. I only see red cross people and no refugies. Plus there isn't any refugee in Monaco. And if there is, for sure there is no asylum. The pics are vague and taken from a distance. Couldn't really see anything. http://www.state.gov/j/drl/rls/hrrpt/2007/100574.htm. this has a section on the Monaco government's commitment to refugees. Given the political sensitivity of the refugee "question", it is good to see the the Prince giving his public support to the Red Cross's refugee program. Well those refugees (invaders actually) hit the jackpot. Asylum in Monaco! Wow! The Monaco government pays for everything, and they live the life of the rich and famous. Sweet! KLC: If the background of the pictures--an empty derelict building and makeshift structures--represents where asylum-seekers are dossing in Monaco, their lives would hardly be "sweet" at this point in time. 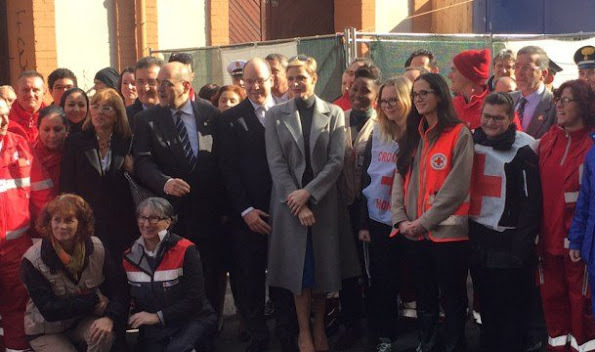 The Red Cross- the world's first and most famous aid agency - would hardly waste their time in Monaco if "the Monaco government were paying for everything". I am not sure why you would think that a person who arrives in Monaco with nothing - who may not even speak the local language – would be assured of "living the life of the rich and famous". To my knowledge, nobody is granted asylum just because they arrive in a country and ask for it. Trying to survive with no income in a strange place where the courts are considering whether or not to deport you (this is the default position of most western nations) can hardly be called "hitting the jackpot". And while I am sure that anyone would feel elated once being granted asylum, I can sure you, from my work with employment relief, that those granted asylum are neither “rich” nor “famous” as you suggest, but earn the lowest incomes in society. Except of course when they are living off the mandated tax payer funded benefits of free housing, free education, free medical care and weekly cash payments when they reach countries like Britain. Incorrect, the United States grants immediate asylum to all Cuban nationals who can make it to American shores. 1:41 People do not pay taxes in Monaco, so those refugees can not be spending "tax payers" money there. The sunglasses do seem unneccesary if they're always on top of her head. As for refugees? Hard to say if they are there, but I for one, having been to Monaco in 1955, certainly wouldn't mind living there. It is gorgeous!! Why? You do see the sun on the pictures and she takes them on her head so people see her eyes when she talkes to them and taking pictures. Less to learn for other "real" royals. 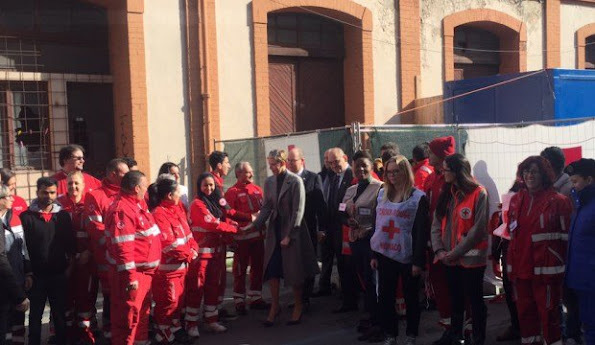 Red Cross members who are working with refugees but surely not in Monaco. 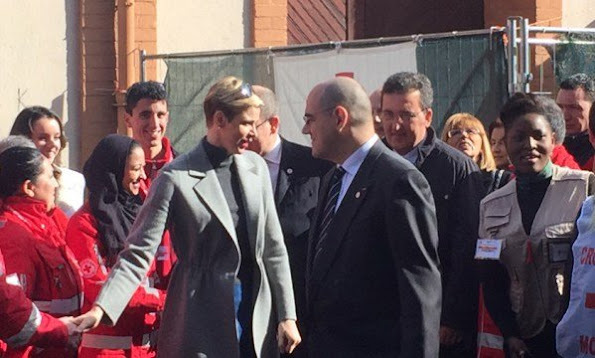 always negative and must give criticism Those comment on Princess Charlene's sunglasses is pathetic creatures. Cet évènement n'avait pas lieu à Monaco, mais à Vintimille en Italie, tout près de Monaco. This event was'nt in Monaco, but took place in Vintimille in Italia, close to Monaco. The Monaco Red Cross has been involved for several months in helping its Italian counterpart provide basic essentials, such as food and water and rudimentary shelter for hundreds of migrants. France has re-imposed border controls in an attempt to stop refugees crossing from Italy. I am from Greece,and always take mine on my head's top...but always!We have a lot of sunlight here girls!!! charlene is a class act, unlike waity!!!! Can we stop referring tof Catherine as 'waity'? She is almost married 5 years now. They were together for 10. The last 3 of those they were basically engaged. They belonged together and who cares how long it took? If she had met and married him quickly you would be calling her other names. Jealousy .... pure jealousy and dislike for a person you have never met and never will. I love how many act like the knee these people! We don't so you shouldn't have these kinds of feelings towards a person you don't know. That is just saying you are jealous and perhaps have a dull life?